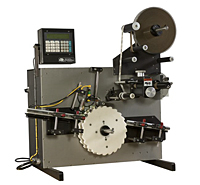 Tabletop Wrap Labeler Round products are manually loaded onto the infeed magazine. The indexing starwheel will remove one product at a time from the infeed magazine with each indexing motion. Once products have been captured by the starwheel, they are indexed to the labeling station where a powered roller spins the product as the label is applied.